Did you know that energy saving light bulbs and batteries contain small amounts of toxic metals such as mercury. Throwing anything containing mercury into normal household or commercial bins can be very harmful to the environment. The City of London is home to many household residents as well as commercial and business residents. As such, the area creates a lot of battery and light bulb waste, which up until now has been difficult to recycle efficiently. In order to reduce the amount of dangerous chemicals entering the atmosphere through improper disposal of batteries and light bulbs the City if London has launched a new scheme. Residents can now recycle their household batteries and low energy light bulbs at various recycling points across the City. There are many specific bins dotted around the City of London marked with battery recycling or light bulb recycling. 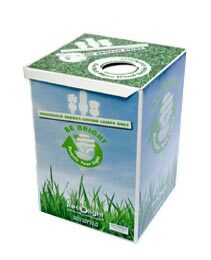 As well as these bins and locations batteries and low energy light bulbs can also be recycled over the counter at most Robert Dyas stores within the City. In addition, batteries can also be recycled by taking them to your nearest Curry’s, Boots, Tesco or Sainsbury’s. ← Need to clear an office?